• Magnifiso's white 12 x 17 guest towels provide the convenience of disposable tissue napkins with the luxury of a linen-like cloth towel. • Place them in a gathering basket at a cocktail party as fingertip towels for all to enjoy. • Made of soft paper with the look & feel of linen, we are sure you'll be happy with your purchase of these guest towels. 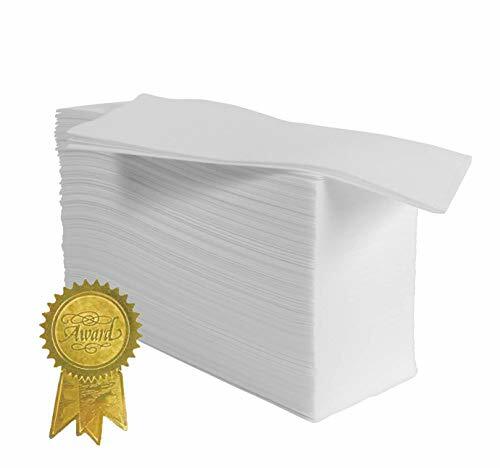 200 PREMIUM QUALITY LINEN-FEEL DISPOSABLE PAPER TOWELS Made of durable paper fiber that feels like a cloth napkin with no need to wash after using- Drying Hands becomes a pleasure using a fresh clean towel - No more worrying about spreading or catching germs. EXTRA SOFT, EXTRA ABSORBENT, SINGLE-USE Towels Are specially formulated to look and feel like a cloth towel with the versatility & convenience of paper. Washing hand towels will be a thing of the past once you try these out!. PARTY PLANNERS: THESE TOWELS ARE ALSO IDEAL FOR SPECIAL OCCASIONS, LARGE PARTIES & GET-TOGETHERS. Magnifiso's "Cloth Like" paper napkins are pure white adding elegance and luxury to events and celebrations. They are perfectly suited for a cocktail party, wedding dinner, hotel rooms, powder rooms, and more. TRULY VERSATILE ALL AROUND THE HOUSE : Mostly used in Guest-Rooms, Bathrooms and near sinks but can also be an excellent Dinner Napkin, a Cleaning & Wiping cloth for Surfaces & Counters, and useful anywhere a strong & durable towel is needed. GENEROUSLY SIZED TOWELS + SPECIAL PRICING FOR BULK ORDERS : Measure 12" by 17" when unfolded and 4" by 8.5" when folded, they can be stored conveniently and will fit neatly into any towel holder. Pre-folded so that you have a choice whether to use as a napkin or hand towel throughout your home. If you have any questions about this product by Magnifiso, contact us by completing and submitting the form below. If you are looking for a specif part number, please include it with your message. Atlas Economy White Cotton Salon, Gym, Spa, Hand Towels (48-Pack) 100% Cotton, Size 16x27"